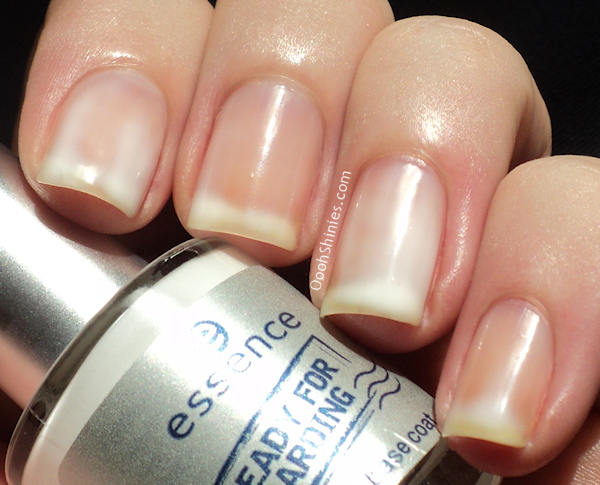 Yesterday I bought the Essence Peel Off Base Coat from their Ready For Boarding LE (which I'll call POBC from now on). This base coat is also in their new core line, and if you're lucky, you already have the new displays in your store including this base coat. I've read some positive and negative reviews about this, so I wanted to test it myself and show you how it works! According to the press release, this POBC is handy for when you're in a rush, you won't need remover but can just peel it off. Then reapply the POBC and polish again. But ehm, I still need remover, I always do a cleanup! And having to wait for 10 minutes before I can start with polishing doesn't sound ideal for when I'm in a rush either, if I slap on a 1-coater and do a cleanup I'm done within that time. So no, for those reasons I wouldn't use it. 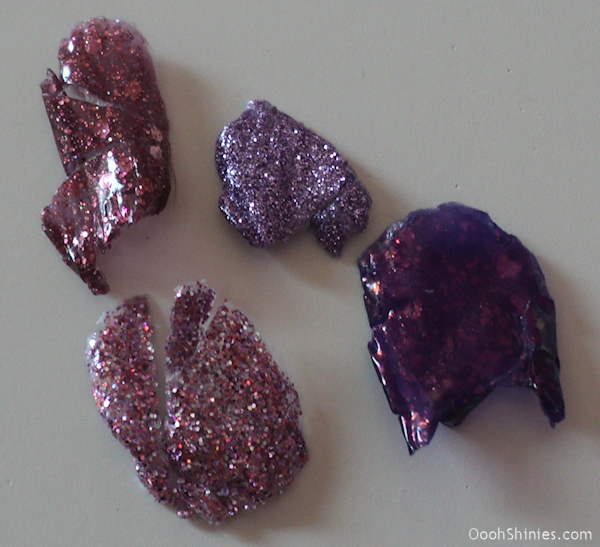 But when I heard about this POBC I thought of glitter polish, as many of you did as well. Imagine this would work! I have no problems with having to apply a base coat first and waiting for a bit before applying glitters. 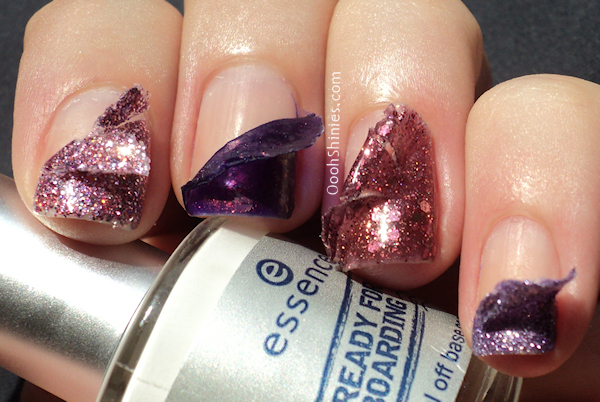 The removal of the glitters should be faster like this and hopefully nicer to your nails than using the foil method. So today I'm testing the POBC with 3 different glitter polishes and a flakie, because I can't say I like their removal either (fish scaled fingers, lovely!). 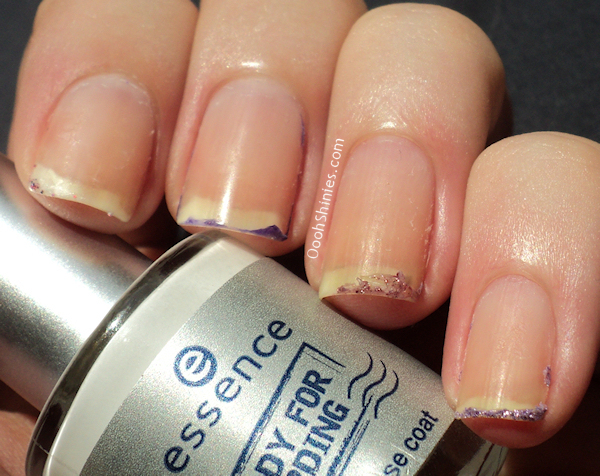 Step 1 Apply a generous layer of the peel off base coat to your nails. Allow approximately 10 minutes to dry until the white base coat becomes transparent. Step 2 Paint your favourite colour nail polish and/or effect nail polish over it and let it dry. Step 3 Simply peel off to remove! Does not harm to your nails. The POBC is a white polish, and it reminds me of the craft glue I used as a kid! The white goes transparent as well, it's a bit goopy too, and even the smell reminds me of that glue! But I'll just assume this isn't glue mixed with a base coat, haha. 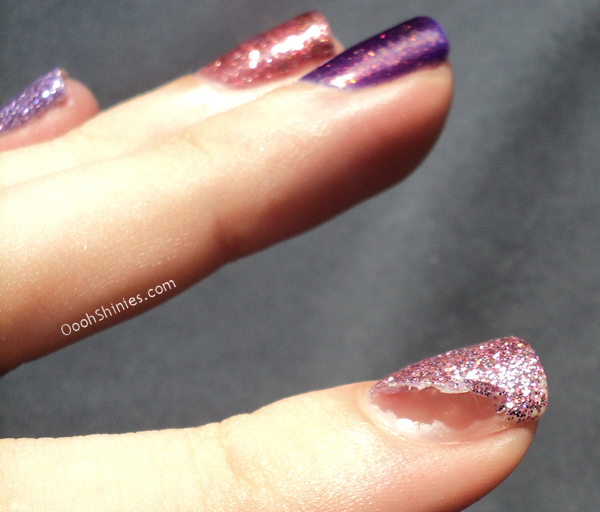 Here's what my nails looked a few minutes after applying the POBC. After the application all nails look white, and you can clearly see where I applied it a bit thicker, those areas are still more white here. The areas that are becoming transparent have dried more. After the 10 minutes all my nails have a glossy, transparent coat. Tip: if you get the POBC on or near your cuticles, do a cleanup straight away. When you wait and do it afterwards, it gets all rubbery (like the glue again, haha) and a bit harder to remove without peeling off the POBC and polish from your nails as well. I applied the polishes and used 1 layer of top coat on all nails, because that's what I'd usually do as well. 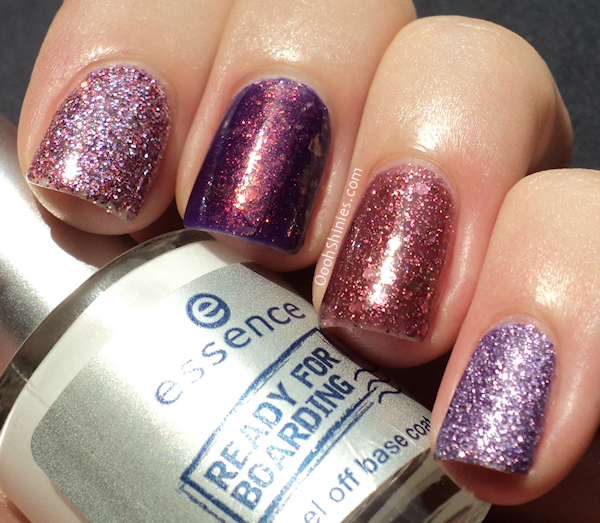 From index to pinkie: Color Club Candy Cane, Nfu.Oh 51, Essence Time For Romance, Nubar Hyacinth Sparkle. The little bit of tip wear on my indexfinger was caused by me using my nails, not by the base coat. And the result on my nails. Please note the little bits and pieces on my nails are NOT my nails that peeled as well, but tiny bits of rubbery base coat that remained after the peeling! Update: Turns out it's pretty much glue with some preservatives. So I wasn't that far off when I said it reminded me of glue, lol! Several people tried it and you can use pva glue as well, just pour it into an empty bottle and you're good to go!